Our Cardlock Stations are located at 5608-45th street in Leduc and 202-18 Avenue in Nisku. They offer the ultimate in convenience, with 24-hour access to dyed and regular gas and diesel. Keep track of your fuel purchases with monthly billing, which is particularly important for work fleets. Cardlock invoices can now be received electronically and your cardlock account comes with all the benefits of Co-op membership. 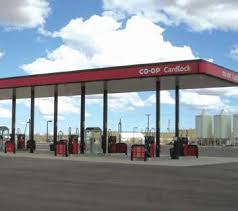 Your cardlock can be used at any Co-op Cardlock Station in Canada, though you only earn membership credit at the Leduc Co-op Cardlock Stations. Cardlocks are not just for truckers, anyone can apply for an account. Our bulk petroleum stations offer convenience, customer service and membership benefits! We deliver gas and diesel - dyed or regular - to farms, gravel truck haulers, road crews and other job sites. You keep working while our fleet of six delivery trucks makes sure your fuel tanks don't run dry. For the safest and best above ground fuel storage, choose from our line of tank packages, tailored to your agricultural or commercial operation. Ask about our Fuel Tank lease program. 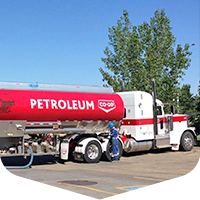 Put in a bulk petroleum delivery order by calling (780) 986-3000 to place your order today.